Dr. Yu-Ru Lee received his undergraduate training at the National Tsing-Hua University in Taiwan. He completed his Master’s degree in the School of Biochemistry and Molecular Biology at National Yang-Ming University. Yu-Ru obtained his PhD in the School of Molecular Medicine at National Taiwan University, under the supervision of Dr. Ruey-Hwa Chen, for his work on the role of ubiquitin E3 ligase KLHL20 in cancer progression. He has been a post-doctoral fellow in the laboratory of Dr. Pier Paolo Pandolfi since April 2014. 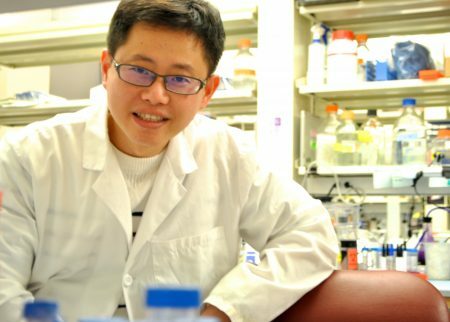 His studies focus on the roles of PTEN post-translational and post-transcriptional regulation in tumor progression. 2011 Poster Presentation Distinguished Achievement Award, the 19th Symposium on Recent Advances in Cellular and Molecular Biology. 2011 The Excellent Research Paper Award from Dr. Tien-Te Lee’s Biomedical Foundation. April 2014 ~ April 2016 Postdoctoral Research Abroad Program fellowship, Taiwan National Science Council (NSC). June 2016 ~ August 2018 DOD prostate cancer post-doc training fellowship.